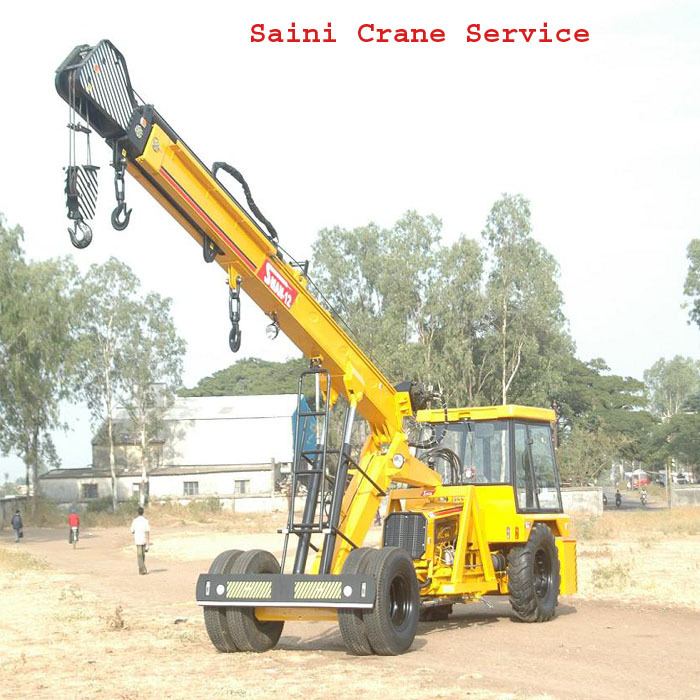 Crane :- A crane is a lifting machine, generally equipped with a winder (also called a wire rope drum), wire ropes or chains and sheaves, that can be used both to lift and lower materials and to move them horizontally. It uses one or more simple machines to create mechanical advantage and thus move loads beyond the normal capability of a human. Cranes are commonly employed in the transport industry for the loading and unloading of freight, in the construction industry for the movement of materials and in the manufacturing industry for the assembling of heavy equipment. 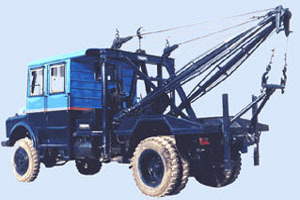 A crane mounted on a truck carrier provides the mobility for this type of crane. Generally, these cranes are able to travel on highways, eliminating the need for special equipment to transport the crane. When working on the jobsite,outriggers are extended horizontally from the chassis then vertically to level and stabilize the crane while stationary and Many truck cranes have slow-travelling capability (a few miles per hour) while suspending a load. Great care must be taken not to swing the load sideways from the direction of travel, as most anti-tipping stability then lies in the stiffness of the chassis suspension. Most cranes of this type also have moving counterweights for stabilization beyond that provided by the outriggers. Loads suspended directly aft are the most stable, since most of the weight of the crane acts as a counterweight. Factory-calculated charts (or electronic safeguards) are used by crane operators to determine the maximum safe loads for stationary (outriggered) work as well as (on-rubber) loads and travelling speeds.Truck cranes range in lifting capacity from about 14.5 US tons to about 1300 US tons. Rough terrain crane A crane mounted on an undercarriage with four rubber tires that is designed for pick-and-carry operations and for off-road and "rough terrain" applications. Outriggers are used to level and stabilize the crane for hoisting. These telescopic cranes are single-engine machines, with the same engine powering the undercarriage and the crane, similar to a crawler crane. In a rough terrain crane, the engine is usually mounted in the undercarriage rather than in the upper, as with crawler crane. A mobile crane with the necessary equipment to travel at speed on public roads, and on rough terrain at the job site using all-wheel and crab steering. AT‘s combine the roadability of Truck-mounted Cranes and the manoeuvrability of Rough Terrain Cranes.AT’s have 2-9 axles and are designed for lifting loads up to 1200 metric tons. A crawler is a crane mounted on an undercarriage with a set of tracks (also called crawlers) that provide stability and mobility. Crawler cranes range in lifting capacity from about 40 US tons to 3500 US tons.Crawler cranes have both advantages and disadvantages depending on their use. Their main advantage is that they can move around on site and perform each lift with little set-up, since the crane is stable on its tracks with no outriggers. In addition, a crawler crane is capable of traveling with a load. The main disadvantage is that they are very heavy, and cannot easily be moved from one job site to another without significant expense. Typically a large crawler must be disassembled and moved by trucks, rail cars or ships to its next location. A railroad crane has flanged wheels for use on railroads. The simplest form is a crane mounted on a railroad car. More capable devices are purpose-built.Different types of crane are used for maintenance work, recovery operations and freight loading in goods yards. Floating cranes are used mainly in bridge building and port construction, but they are also used for occasional loading and unloading of especially heavy or awkward loads on and off ships. Some floating cranes are mounted on a pontoon, others are specialized crane barges with a lifting capacity exceeding 10,000 tons and have been used to transport entire bridge sections. Floating cranes have also been used to salvage sunken ships.Crane vessels are often used in offshore construction. The largest revolving cranes can be found on SSCV Thialf, which has two cranes with a capacity of 7,100 metric tons each. 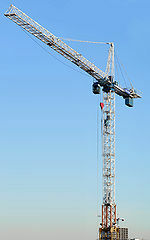 Aerial crane or 'Sky cranes' usually are helicopters designed to lift large loads. Helicopters are able to travel to and lift in areas that are difficult to reach by conventional cranes. Helicopter cranes are most commonly used to lift units/loads onto shopping centers and highrises. They can lift anything within their lifting capacity, (cars, boats, swimming pools, etc.). They also perform disaster relief after natural disasters for clean-up, and during wild-fires they are able to carry huge buckets of water to extinguish fires.Some aerial cranes, mostly concepts, have also used lighter-than air aircraft, such as airships. 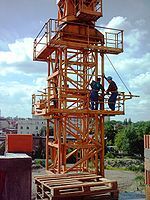 The tower crane is a modern form of balance crane. Fixed to the ground (and sometimes attached to the sides of structures as well), tower cranes often give the best combination of height and lifting capacity and are used in the construction of tall buildings.The jib (colloquially, the 'boom') and counter-jib are mounted to the turntable, where the slewing bearing and slewing machinery are located. The counter-jib carries a counterweight, usually of concrete blocks, while the jib suspends the load from the trolley. The Hoist motor and transmissions are located on the mechanical deck on the counter-jib, while the trolley motor is located on the jib. The crane operator either sits in a cabin at the top of the tower or controls the crane by radio remote control from the ground. In the first case the operator's cabin is most usually located at the top of the tower attached to the turntable, but can be mounted on the jib, or partway down the tower. The lifting hook is operated by using electric motors to manipulate wire rope cables through a system of sheaves.In order to hook and unhook the loads, the operator usually works in conjunction with a signaller (known as a 'rigger' or 'swamper'). They are most often in radio contact, and always use hand signals. The rigger directs the schedule of lifts for the crane, and is responsible for the safety of the rigging and loads.A tower crane is usually assembled by a telescopic jib (mobile) crane of greater reach (also see "self-erecting crane" below) and in the case of tower cranes that have risen while constructing very tall skyscrapers, a smaller crane (or derrick) will often be lifted to the roof of the completed tower to dismantle the tower crane afterwards.It is often claimed that a large fraction of the tower cranes in the world are in use in Dubai. The exact percentage remains an open question. Self-erecting crane Generally a type of tower crane, these cranes, also called self-assembling or "Kangaroo" cranes, lift themselves off the ground using jacks, allowing the next section of the tower to be inserted at ground level or lifted into place by the partially erected crane itself. They can thus be assembled without outside help, or can grow together with the building or structure they are erecting. A telescopic crane has a boom that consists of a number of tubes fitted one inside the other. A hydraulic or other powered mechanism extends or retracts the tubes to increase or decrease the total length of the boom. These types of booms are often used for short term construction projects, rescue jobs, lifting boats in and out of the water, etc. The relative compactness of telescopic booms make them adaptable for many mobile applications. Note that while telescopic cranes are not automatically mobile cranes, many of them are. These are often truck-mounted. 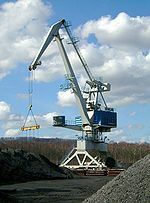 The "hammerhead", or giant cantilever, crane is a fixed-jib crane consisting of a steel-braced tower on which revolves a large, horizontal, double cantilever; the forward part of this cantilever or jib carries the lifting trolley, the jib is extended backwards in order to form a support for the machinery and counter-balancing weight. In addition to the motions of lifting and revolving, there is provided a so-called "racking" motion, by which the lifting trolley, with the load suspended, can be moved in and out along the jib without altering the level of the load. Such horizontal movement of the load is a marked feature of later crane design. These cranes are generally constructed in large sizes, up to 350 tons.The design of hammerkran evolved first in Germany around the turn of the 19th century and was adopted and developed for use in British shipyards to support the battleship construction program from 1904-1914. The ability of the hammerhead crane to lift heavy weights was useful for installing large pieces of battleships such as armour plate and gun barrels. Giant cantilever cranes were also installed in naval shipyards in Japan and in the USA. The British Government also installed a giant cantilever crane at the Singapore Naval Base (1938) and later a copy of the crane was installed at Garden Island Naval Dockyard in Sydney (1951). These cranes provided repair support for the battle fleet operating far from Great Britain.The principal engineering firm for giant cantilever cranes in the British Empire was Sir William Arrol & Co Ltd building 14. Of around 60 built across the world few remain; 7 in England and Scotland of about 15 worldwide.The Titan Clydebank is one of the 4 Scottish cranes on the Clydebank and preserved as a tourist attraction. Level luffing crane Normally a crane with a hinged jib will tend to have its hook also move up and down as the jib moves (or luffs). A level luffing crane is a crane of this common design, but with an extra mechanism to keep the hook level when luffing. Gantry crane A gantry crane has a hoist in a fixed machinery house or on a trolley that runs horizontally along rails, usually fitted on a single beam (mono-girder) or two beams (twin-girder). The crane frame is supported on a gantry system with equalized beams and wheels that run on the gantry rail, usually perpendicular to the trolley travel direction. These cranes come in all sizes, and some can move very heavy loads, particularly the extremely large examples used in shipyards or industrial installations. A special version is the container crane (or "Portainer" crane, named by the first manufacturer), designed for loading and unloading ship-borne containers at a port. Overhead crane Also known as a 'suspended crane', this type of crane work very similar to a gantry crane but instead of the whole crane moving, only the hoist / trolley assembly moves in one direction along one or two fixed beams, often mounted along the side walls or on elevated columns in the assembly area of factory. Some of these cranes can lift very heavy loads. A loader crane (also called a knuckle-boom crane or articulating crane ) is a hydraulically-powered articulated arm fitted to a truck or trailer, and is used for loading/unloading the vehicle. The numerous jointed sections can be folded into a small space when the crane is not in use. 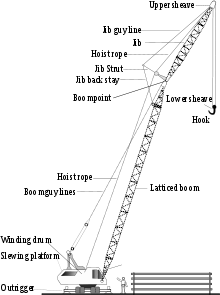 One or more of the sections may be telescopic. 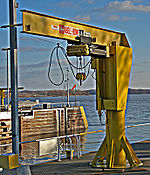 Often the crane will have a degree of automation and be able to unload or stow itself without an operator's instruction. In the UK and Canada, this type of crane is almost invariably known colloquially as a "Hiab", partly because this manufacturer invented the loader crane and was first into the UK market, and partly because the distinctive name was displayed prominently on the boom arm. A rolloader' crane is a loader crane mounted on a chassis with wheels. This chassis can ride on the trailer. Because the crane can move on the trailer, it can be a light crane, so the trailer is allowed to transport more goods. Stacker crane A crane with a forklift type mechanism used in automated (computer controlled) warehouses (known as an automated storage and retrieval system (AS/RS)). The crane moves on a track in an aisle of the warehouse. The fork can be raised or lowered to any of the levels of a storage rack and can be extended into the rack to store and retrieve product. The product can in some cases be as large as an automobile. Stacker cranes are often used in the large freezer warehouses of frozen food manufacturers. This automation avoids requiring forklift drivers to work in below freezing temperatures every day. Copyright ©sainicraneservice.wapath.com All rights reserved.